I forgot about ME growing! 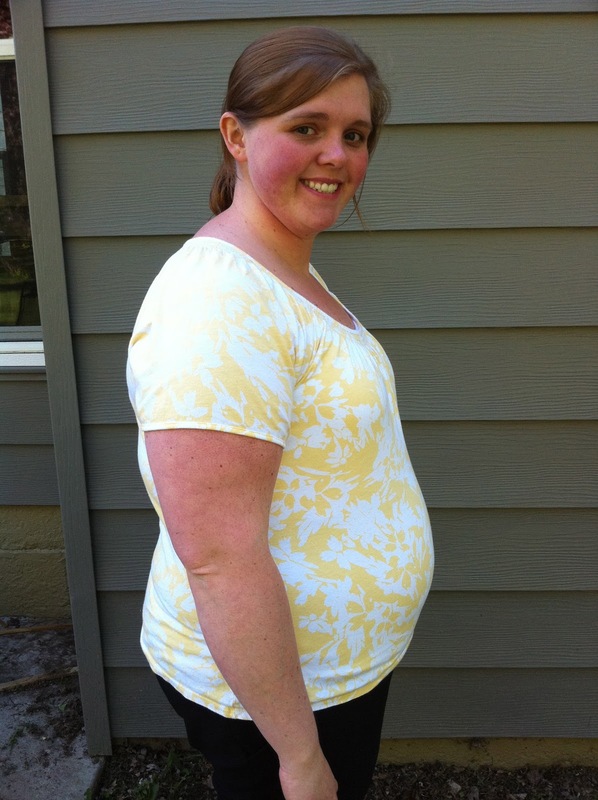 This blog is called "Growing and Sewing Lesa," but I haven't shared any of my growing! Just a quick post with pictures from the last 5 months! 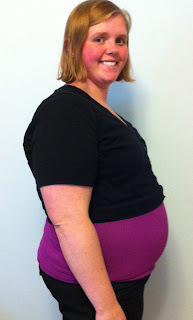 I am currently 35 weeks along and will not be going past due because of my gestational diabetes. This means less than 5 weeks and our little guy will be here! Looking back at these pictures makes me realize how quickly the time as gone. 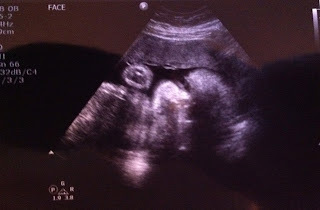 I have truly loved being pregnant, but can't wait to meet my son. 13 weeks, pretty much just my pudge! 35 weeks, ONLY 5 to go! 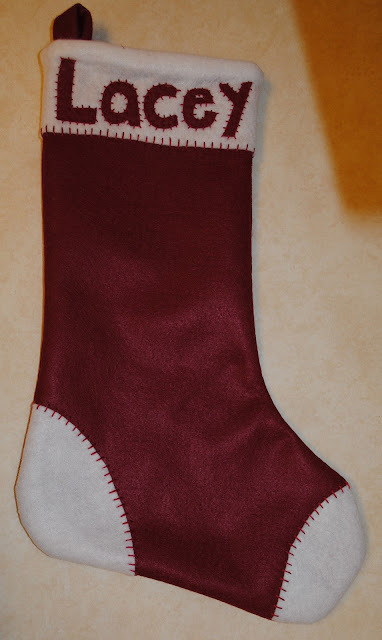 The first year Jimmy and I were married I decided to make up stockings. This became "our" first holiday tradition. Each year I add a new patch to each of our stockings so the tradition continues to evolve. This year I offered to make some for a few family members, plus I needed to make one for our new addition that should be arriving soon! Step 1: Trace template onto felt. The template I use is the sewn size so I stitched along this marker line. Pin two layers together and trim around the edges. Step 2: Cut out white pieces for the heel and toe caps. I made a template for them free hand. Pin between the stocking layers making sure to line up the edges so all three layers will be sewn together. Step 3: Cut rectangular pieces for the cuff and sew to each side of the stocking. It isn't essential to have these sized perfectly as they can easily be trimmed to suit your preferences. Step 4: Flip up the cuffs so they are sticking above the stocking. 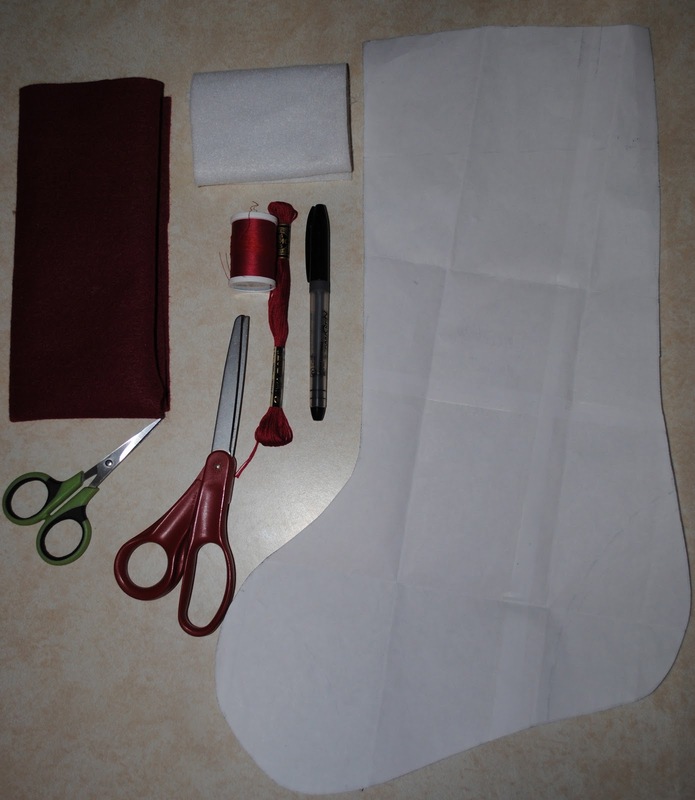 Sew around the perimeter of the stocking starting under the cuff on one side and ending on the other side. DO NOT SEW THE CUFF SIDES YET! Step 5: Turn the stocking right side out being careful the turn the toe and heel caps to the correct side. Keep the cuffs folded out above the stocking. Step 6: This is where is can get tricky! 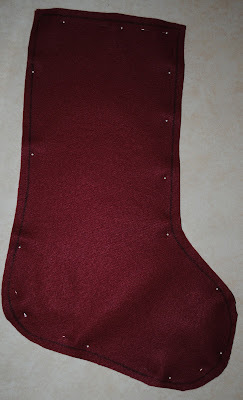 Sew the edges of the cuffs so they line up as close as possible with the finished edge of the stocking. Trim the excess. Flip the cuff down so all seams are hidden. Step 7: Using embroidery floss, straight stich the cuff in place all the way around. Repeat this stitch on the toe and heel caps. This is both functional and decorative. Step 8: Finishing touches. You can add a name by simply cutting out letters and stitching in place. I tack them down with a little glue to make sure they stay in line. Step 9: Add a loop so it can be hung. 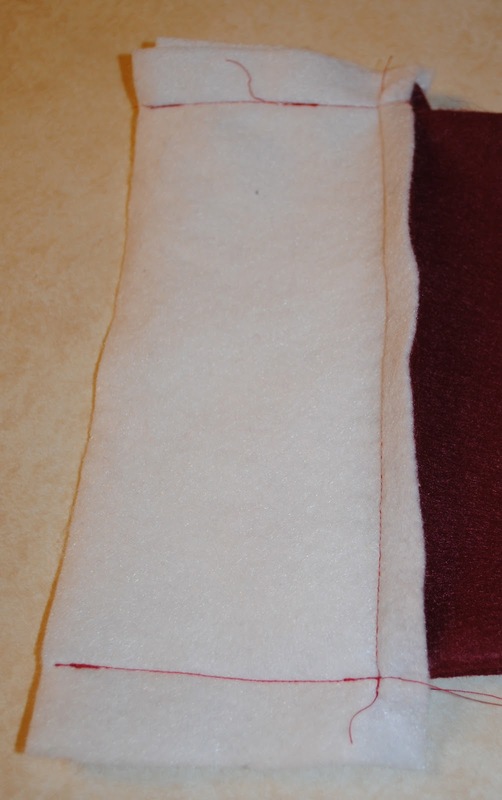 You can either use a single strip of felt or a double one. I made this the same way at the curtain tabs in my August 7th post. Sew this to the inside of the stocking, making sure to position it so the stocking will hang flat. That's it! You are ready to fill it with Christmas goodies! 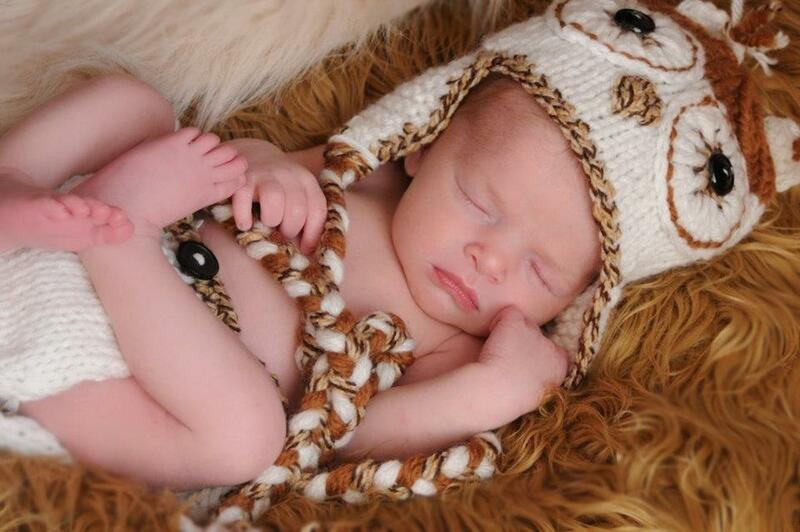 It has been forever since I posted, but we have been so busy! I am hoping to get to the rest of my sewing soon as this baby is almost here! 7 weeks or less to go... On Saturday I had my first baby shower hosted by my good friend Kayla. It was a pretty small group, but we still had a blast! The snack table looked great and even had some GD friendly items which I greatly appreciated! 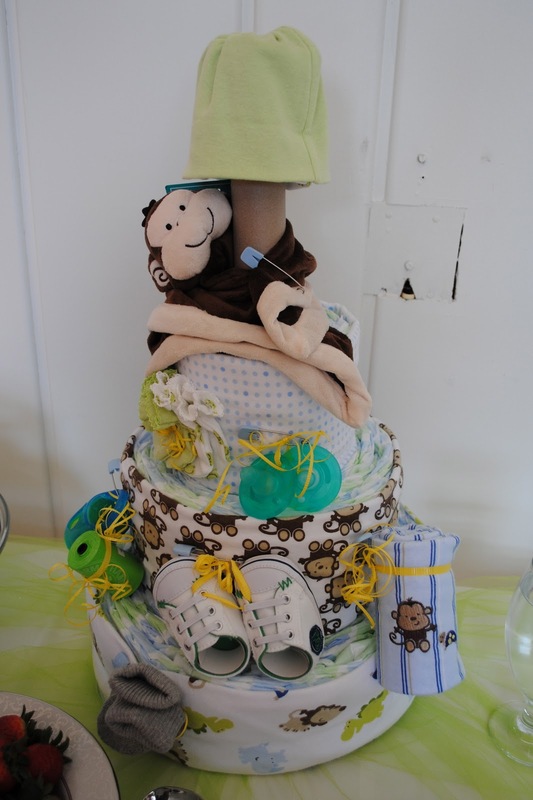 Kayla made a super cute diaper cake too, which I had never heard of before. I love the monkey theme since it goes with the nursery and can't wait to make one myself! We even had a couple of little ones that joined in the festivities. Elise and Kyla became friends quickly, except when they were fighting over the plastic hanger. We played a get-to-know the mom game, a candy matching game and my favorite - the dirty diaper game! I have heard so much about this, but never got to play. I think you have to have the right type of momma to pull this one off and it was right up my ally! Everyone really enjoyed themselves! I realize now that I didn't get any pictures of me or my hostess... a little bummed... But I am so thankful for the generosity of great friends and the fun afternoon we had together. Our baby haven is coming together. We have it painted, furniture is assembled and sewing projects are well under way! Just thought I would share a couple photos of how the room has evolved since we bought our home. Below is how the room looked when we closed. 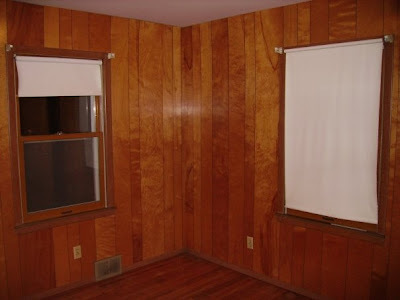 There was wall to wall paneling! It was awful! We even discovered a huge hole in the sheetrock! Luckily my dad is handy and he patched it up for us. 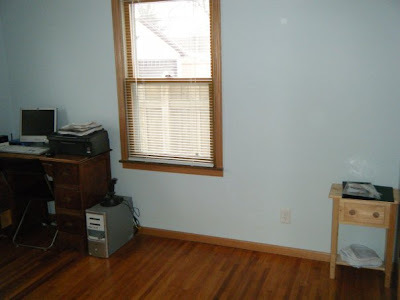 We painted the room blue and used it as an office and music room for a while. We had a day bed in there for about a year as well so it was a full fledged guest room! It is now finally a NURSERY! Or at the least the start of one. I still need to decide where to hang my felt monkey art...Suggestions are welcome! We are still looking to add a small table next to the glider with a lamp as well as a bookcase next to the crib. I am most excited about the rug! I just bought it tonight at Menards! I was there for other reasons and came across this beauty! I have been looking for a green shaggy rug everywhere that wasn't too big! Best part, it was on clearance, only $20! I love it and can't wait until it's finished and our little guy is home! Part of preparing for our little guy's arrival is getting all (most) of the construction projects I have started over the last 2 1/2 years finished! One big looming project is our breezeway. It has served little function up until now other than a pathway from the garage to the house and a landing place for a lot of junk! 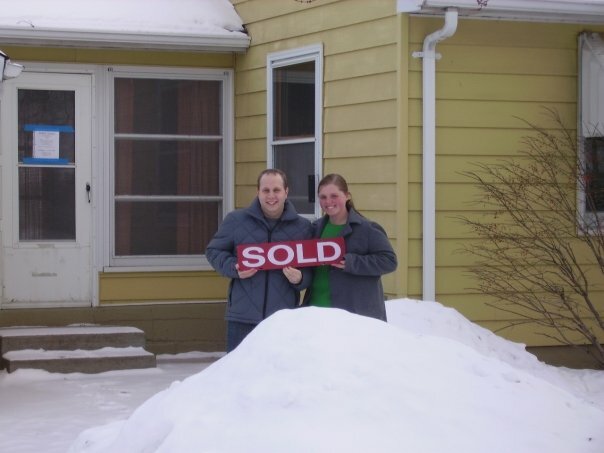 When we first moved in it had storm doors and single pane windows (some broken) lining the exterior walls. These were not very secure nor very weather tight so we made some changes early on. Best picture I have of the outside before any changes. The door and windows are on the left. Almost 2 years ago (EEK) we tore out the old doors and windows and installed new ones! Inside - Lovely dark paneling! Door going in the back! It has been in this general state for the last 2 years, waiting to be finished! Finally this weekend we got around to finishing the trim and drywalling the inside. I also bought some cheap indoor/outdoor carpet to cover the cruddy concrete until we decide what type of flooring to put in (probably next year.) You will also see from the pictures below that we painted our house since installing the windows! I think the gray is a much more appealing color! Our neighbors agree. Those fancy themed switch plate covers can be expensive and it can be hard to find exactly what you want. For the DIY-er there is an easy solution to this. And, if you are already doing projects for a room you can use left over materials for the project! Step 1: Draw your design outline in pencil for painting. I chose to make vertical strips for a very simple look. If your design is not precise then you may not need a ruler. Step 2: Paint your design on, let it dry completely. You may want to do several coats to get full coverage. While this is drying you can cutout portions of fabric or paper to add to your design. Step 3: Using the Mod Podge you can both adhere and seal your cutouts to the switch plate. 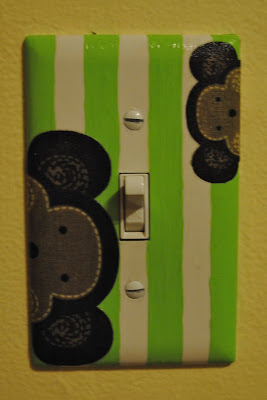 I recommend covering the entire switch plate in at least 2 coats of Mod Podge. This will seal both your fabric or paper cutouts and the paint. Since I used a plastic switch plate this is very important so the pain does not chip off. Step 4: After the switch plate is completely dry you can put it up! A cheap way to spruce up a simple thing in your room and it's guaranteed to match your decor! 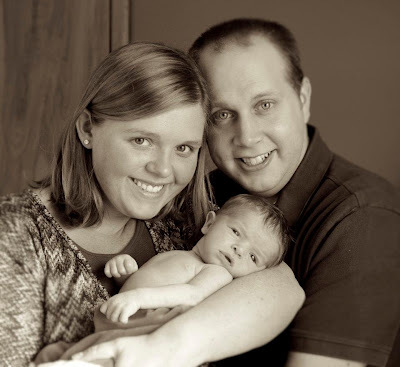 Gestational Diabetes: What's it all about? I am now 3 weeks in to my gestational diabetes and I am finally settling in to it. I didn't know much about it before being diagnosed but I am a semi-expert now! Gestational diabetes (GD) is caused by a hormonal imbalance that occurs in a woman during pregnancy. Large amount of hormones are built up in the placenta to help grow the baby. Sometimes these hormones will do goofy things to a woman's body (most of the time actually!) One of these goofy things is how the woman's body deals with sugars in the blood and the production of insulin. Women with a family history of diabetes or some extra weight on their bodies are more susceptible to having it. I am lucky enough to have BOTH of those factors in my favor! So, you may ask, what's the big deal? There are 2 major reasons to keep your blood sugar levels in check. The first is baby size. All of the extra sugars in the blood that are not processes quick enough can end up as fat deposits in the baby, leading to large infants. A recent example of this is the 16 lb. baby that was born to Texas woman. She let her GD go unchecked and got a very large gift for it! 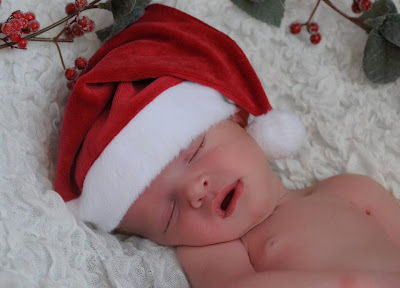 The second reason is to prevent low blood sugar after the baby is born. My baby already has his own this pancreas that is secreting insulin to process the sugars in the blood that passes from my body to his. If those levels remain high for an extended time he will be making lots of insulin to deal with the sugar. As soon as the umbilical cord it cut he won't be getting the extra sugar, but his body with continue pumping our insulin. This can cause his blood sugar to drop which can cause jaundice and even seizures in extreme situations. There are several different ways to treat GD. The main one is through diet and exercise. Every woman has different limits for the number of carbohydrates she can consume and still maintain proper blood sugar. This is were a very tricky balancing act comes in to play. You must eat enough carbohydrates to prevent ketones from building us in your body, but not too much that your blood sugar gets too high. Ketones are kind of complicated so I won't explain them, but they are bad for a baby! I have to pee on little strip each day to check my levels! Many women are able to control their blood sugar with diet alone. Other have to use insulin injections to assist (this is me!) The amount and frequency of shots is dependant on each persons insulin resistance. Below is a picture of all my GD gear! The bottle on the left is the ketone strips that measure the number of ketones in my urine. In the upper center is my finger pricker. The upper right bottle is the diabetes test strips and the glucometer is below that. I have to test my blood sugar 4 times per day, when I wake up and 1 hour after each meal. On the bottom on the picture is my insulin pen and needles. I was VERY nervous about this at first, but it hasn't been too difficult. All I have to do is screw on a new needle each time and pull and twist the knob at the end. Right now I only have to take one shot at night before I go to bed to help with my morning numbers. This is nice because I don't have to worry about carrying the pen and needles around with me! One thing I have enjoyed about this process is finding new recipes that meet my carbohydrates needs (45-60 grams per meals) and modifying favorites to fit as well. I made a new recipe tonight that took a little tweaking, but was so delicious. The original recipe is below and my special notes are below that. Preheat the oven to 450°F. Preheat a grill to high heat. Sprinkle the seasoning evenly over the chicken. Place the chicken on the grill rack. Reduce the heat to medium. (If it is not possible to reduce the heat, cook the chicken away from direct heat.) Grill for 3 to 5 minutes per side, or until no longer pink and the juices run clear. Transfer to a cutting board and let stand for 5 minutes. Chop the chicken into bite-sized pieces. Set aside. Meanwhile, place the pita on the grill rack. Cook for 1 to 2 minutes per side, or until lightly toasted. Place the pita on a nonstick baking sheet. Spread evenly with the hummus. Top evenly in layers with the beans, the reserved chicken, onion, red pepper, tomato, cilantro, and cheese. Bake for 6 to 8 minutes, or until the cheese is melted. Let stand for 5 minutes. Transfer to a serving plate. Slice into 4 wedges. Top each wedge with a teaspoon of guacamole or sour cream, if desired. As mentioned I made a few adjustments. First, I opened and split the pitas so I only piled up on half the pita. This way I was able to cut the pita carbs in half and have more room for the carbless chicken and low carb veggies. All of the toppings are fairly low in carbs except the black beans. This is nice because I really only had to measure the carbs in a couple things to make the meal. I also added some canned corn to mine because we had some left over and I like the sweetness it adds. Corn is also a higher carb (starchy) vegetable so you need to be careful how much you use. Lastly, I cut up some lettuce and topped them with it after baking. The great thing about this recipe is that is can be fun for the whole family too! Everyone can build their own pita to suit their tastes. You could also add other things like jalapenos or squash. I hope you enjoy this recipe as much and we did and learned a little about GD! Happy Eating! I have been so busy lately that I was elated to get back to my sewing machine this week! 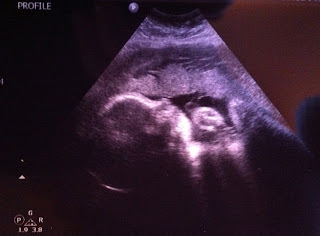 I still have a lot of things to get done and this little guy will be here in no time! On to my next project, crib sheets! Step 1: I have mentioned this before, but always make sure to wash your fabric before starting a project as it will shrink. Most online tutorials will tell you to start with a certain size fabric and give instruction based off of that. 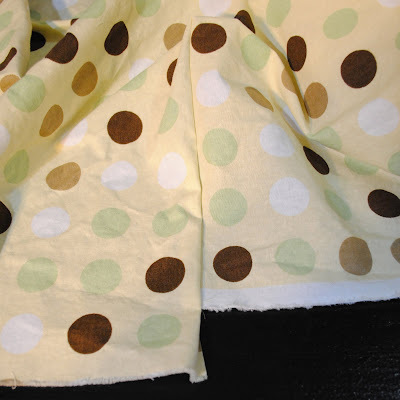 The truth is, every fabric will shrink differently (mine was only 43" wide after washing.) I suggest you start with 2 yard lengths to give yourself a few inches of wiggle room. You may also want to iron your fabric if it comes out of the dryer wrinkly. Step 2: Fold fabric in half on long end and pin ends together. Then fold in half again so all four original corners are together. Make sure you line up by the edge of the fabric and NOT the corners as they may not match exactly. Step 3: Measure 23" from the fold (the long side) and mark the fabric. Measure 14" from the fold (the short side) and mark the fabric. I measured in 2 places to make drawing a cutting line easier. Cut along the line and discard the small pieces. Step 4: Unfold your fabric. We are going to use a double seam in the corners so they won't fray. Line up the edges of each corner with the "good" side out. 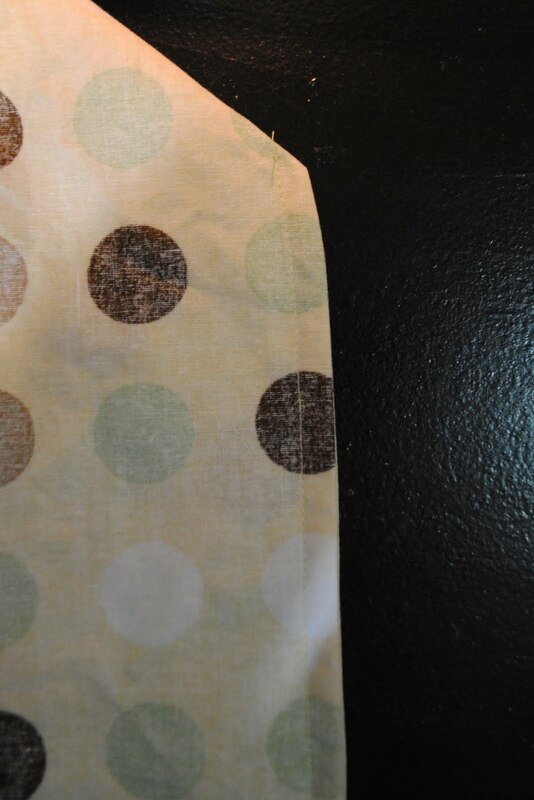 Sew a 1/4" seam. Invert the seam so the good side is in and you have a clean seam on the outside. Sew another seam, 3/8". This will hide the raw edges from the first seam. Do this on all 4 corners. 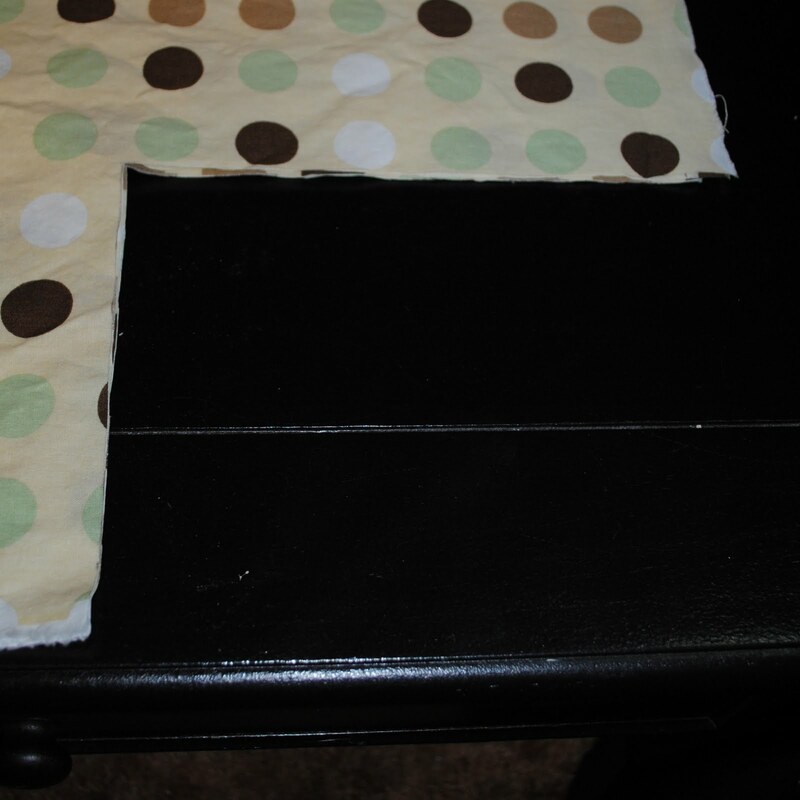 Step 5: You will notice as you are sewing the corner seams that the bottoms do not match up. 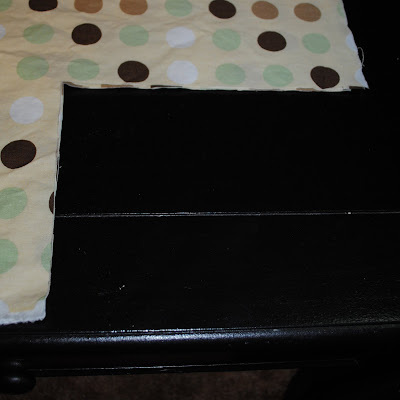 You will need to trim the short edges of the sheet to match up with the long edges. Step 6: Press a 1/4" hem along all edges. Then press another hem 1/2-3/4" and pin in place. Once again, this will hide all raw edges to eliminate fraying. Step 7: Mark a 1" opening starting 8 1/2" from the corners on the long edges (4 total openings.) These will be used to string the elastic through the short ends. Step 8: Sew the hem closed, making sure to leave the elastic opening unsewn. also make sure you sew far enough from the sheet edge to secure down the smaller 1/4" fold. Step 9: Insert elastic into opening with a safety pin. This is and easy way to thread anything in a smaller space. Before you get it all the way through you will need to sew down one end near the first opening. You can either leave the piece sticking out (as pictured) or carefully insert the end into the opening and secure down with several stitches. Finish threading the elastic and sew the other end near the opposite opening. Repeat this process for the other side. Step 10: make sure to sew up each of the openings so nothing has an opportunity to fray. That's it, you're done! Looks great! I am making a total of 6 sheets. While this may seem like a lot, I am planning on keeping them for a second baby someday and I don't want to have to worry about finding the same fabric to make more (which would be impossible.) This way I will have plenty of extras in case we have to throw 1 or 2 out. The next project on my radar is the crib skirt! Hopefully I will be able to start on that in the next couple weeks, I just need to decide on a style. Any of you have a preference or pleats or no pleats? Well, I hope this was helpful to my crafty friends out there. Happy Sewing!